Win WWII With the Turn of a Card! Dynamic Gameplay using cards and map tiles. Combines the best of a card game and a board game. Highly replayable with Geomorphic Map Tiles and with 240 Unit and Action Cards. Solo and 2 player scenarios for the Western Front 1944-1945. 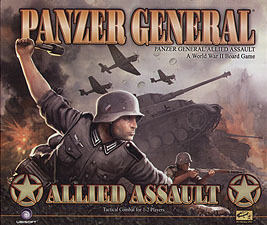 Play both sides as either Germans or Americans.